What Lessons Can We Learn From Labor’s Defeats in Wisconsin in 2011 and 2015? Now that Governor Walker has signed the “right-to-work” bill passed by the Wisconsin legislature, whose purpose is to severely weaken private-sector unions, it is high time for trade unionists to step back and ask ourselves how it is that we have come to this critical juncture. After all, not so long ago Wisconsin was a solid “blue” state, a stronghold of union power, with a progressive tradition associated with Robert M. La Follette Sr. While the setbacks to the Wisconsin labor movement are part and parcel of the corporate class’s across-the-board assaults against unions, the state’s experience has some distinctive features that warrant special scrutiny. Perhaps the best place to begin is to recall what happened in 2011 with the election of Governor Scott Walker and his cronies, who took over the state’s legislature. Once elected, Walker lost no time in unleashing his war against the state’s public-sector unions. 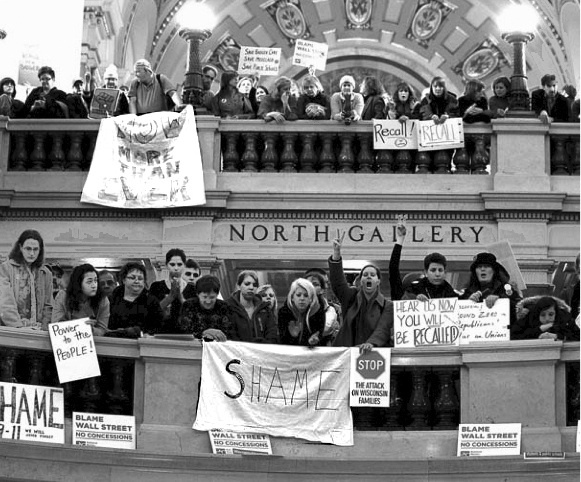 When Wisconsin workers occupied the Capitol and took to the streets by the hundreds of thousands in February and March 2011 to defend their unions and living standards, the effect was electrifying. Workers throughout the U.S. and the world were elated to see American workers taking such militant actions, reminiscent of the 1930s. Messages of solidarity poured in. “WE ARE ALL WISCONSIN!” was heard around the globe. The fight against the bosses’ union-busting and austerity offensive was at last being joined by masses of U.S. workers. “Organized labor, reeling from blows to government workers in Wisconsin and California elections, is grappling with the prospect of diminished political clout and fewer members in public-sector unions that have formed the core of the movement’s power in recent years.” The article goes on to point out that AFSCME’s membership in Wisconsin fell 45% after the Wisconsin legislature approved the law pushed through by Walker, which barred a union shop and made union membership optional. So what went wrong in Wisconsin leading to the current crisis? In the beginning of this struggle, labor leaders, with some significant dissenters, settled on a strategy of agreeing to Walker’s economic demands, which were that union workers in the public-sector pick up a significant part of the tab for their health care and pension benefits. These concessions were announced publicly — without a vote taken of the affected workers– and amounted to over $100 million. But Walker rebuffed the idea that this was a sufficient basis to bring about a settlement of his dispute with the unions involved. Walker’s appetite having been whetted, he continued to demand that the public-sector unions agree to having their members’ collective-bargaining rights stripped away, with police and firefighters excepted. Dissenters strenuously argued that the state was flush with money and there was no justification whatever for cutting workers’ benefits. Indeed, Walker’s budget included tax breaks for corporations and the rich that would cost the state of Wisconsin taxpayers $2.3 billion over the next decade. What was needed was to increase taxes on the wealthy, not balance the budget or reduce any deficit on the backs of the workers. But the other question raised by dissenters was this: In conducting negotiations with Walker, would it not have been infinitely better to begin by taking a firm stand against any givebacks? 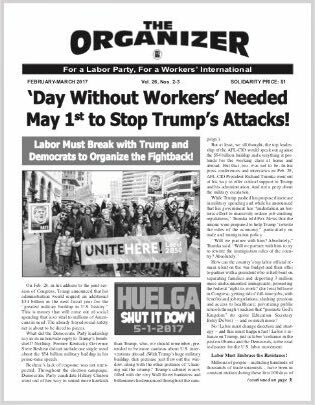 Why start off negotiations with Walker and his fellow reactionaries by conceding so much without giving a massive fightback movement a chance to get off the ground in support of a “NO CUTS!” demand, along with building the campaign to prevent obliterating workers’ collective bargaining rights? The reason this is so important is that it gave legitimacy to the utterly false notion that public-sector union workers are overly compensated. In this age of austerity, nothing pleases the corporate class more than to have union leaders say, “Yes, our members are willing to ‘share in the sacrifice’ and we agree that they must accept cuts in wages and benefits.” And of course the right wing in Wisconsin was happy to run with that kind of glowing endorsement of its position. It is particularly outrageous to target public workers because during the past three decades the wealth of the rich has risen astronomically, thanks in large part to their tax rates going down. With the occupation of the Capitol and the gigantic demonstrations reaching a showdown stage, something had to give. 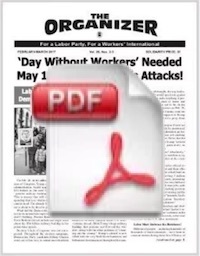 The South Central Federation of Labor in Wisconsin adopted a resolution calling for exploration of the idea of a general strike as a possible next step. If the labor movement had united on a national basis at that point and called a truly massive Solidarity Day 3 “March on Madison!” it could well have spurred more far-reaching actions by the Wisconsin labor movement, including a generalized work stoppage and mass civil disobedience. In the absence of such national support, Walker’s legislation was approved, and the struggle was then diverted to electoral channels by labor leaders and the Democratic Party. First it was the failed effort to elect a more liberal justice to the Wisconsin Supreme Court; then the first efforts to recall Republican state senators; then labor’s losing campaign in the Democratic primary to elect Kathleen Falk as the party’s candidate for governor (who, by the way, would not agree to the goal of a full restoration of Walker’s public-service cuts or restoration of public workers’ benefits, and campaigned on her record of slashing $10 million from workers’ wages and benefits when she was Dane County Executive), and finally the attempt to recall Walker and elect Tom Barrett governor, which was decisively defeated. Barrett is truly a piece of work. As Milwaukee mayor, he sought union concessions that went beyond those mandated by Walker’s collective-barraging law, according to an AFSCME statement. In a debate with Walker, he made clear he was not labor’s candidate. He also said that he would not increase taxes on corporations and the wealthy. During the outpouring of opposition to Walker’s budget, Barrett proposed an “alternative budget repair bill” that included Walker’s cuts to benefits and pensions, but extended them to police and fire fighters, whom Walker had spared. The Wisconsin labor movement was deeply divided in the recall campaign. According to the exit polls, 38% of union households voted for Walker, as did 67% of male blue-collar workers. For the labor movement to shift its focus from independent mass action in the streets to supporting Democratic Party politicians was a sure recipe for defeat. The Wisconsin experience underscores again the need for the U.S. labor movement to establish independent labor/community coalitions and run candidates for public office, based on a program reflecting the needs and aspirations of the working class majority, and with candidates accountable to the base. Such an independent working class political movement could go a long way toward unifying the working class and cementing ties with the youth, students, communities of color, and other progressive sectors of the population. According to the New York Times (2/27/15), “Similar to ‘right-to-work’ laws in 24 other states, the [Wisconsin] bill would prevent unions from requiring dues or other fees from workers they represent in collective bargaining, a crippling restraint.” The Times also notes that the bill is almost verbatim from a model provided by the American Legislative Exchange Council (ALEC), which is tied to the Koch brothers, who have announced they will spend $900 million in the 2016 presidential campaign. The survival of the labor moment as an effective social force is today in serious jeopardy and needs to be addressed without delay. We urge that union meetings at the local, state and regional levels be organized to take a hard look at where we are at and what we need to do to counteract the corporate class’s offensive. To be sure, the best course would be for the major unions on the national level to join together to convene an emergency Congress of Labor to get the ball rolling on an alternative strategy and an alternative program, one that recognizes the enormous power the labor movement still has at its command — especially when allied with community partners with complementary interests — if only it would use that power to mobilize millions to defend our rights, wages, benefits and working conditions, and rescind the repressive measures that have so severely weakened our movement. The strategy being pursed at this time — depending on the politicians of the major political parties to make the needed changes and bail us out — is certainly not working! It’s time for a change!